Children are admitted on a first-come, first-serve basis. As vacancies become available, children are admitted based on a waitlist followed by new enrollment. There is an annual re-enrollment period during which time parents of enrolled children are provided an opportunity to re-enroll their children for the following year. After the re-enrollment period, all vacancies become open for enrollment to the general public. A child’s enrollment is secured once the enrollment fee & required enrollment documents have been received by the school office. All children admitted to Faith Lutheran School & Daycare are required to provide the school office with Florida Department of Health forms: Certificate of Immunization (form DH-680) and School Entry Health Exam (form DH-3040). 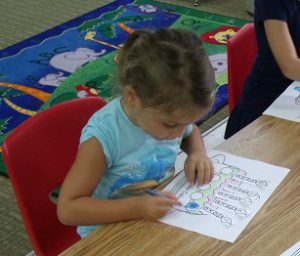 Children entering our pre-school programs must be the age of the enrolled program on or before September 1st of the enrollment year. We strongly encourage children enrolling in the 3-year old program be potty trained upon entering the program. All of our enrollment documents are available below for download or printing. Documents listed under “Return to School” should be completed and returned to the school office along with the enrollment fee & the Florida Department of Health forms. Documents listed under “For Your Review” should be reviewed, but do not need to be returned to the office. Children who are re-enrolling only need to return the Faith Lutheran Enrollment Application and the Acknowledgment. If you have any questions, please contact the school office at 321-452-4143.